With the invitation of the Australia Education Management Group, the delegation of The University of Western Australia under the leadership of Prof. Kent Anderson, Deputy Vice Chancellor (Community & Engagement) and the delegation of University of Tasmania under the leadership of Mr. Robert Atkinson, Deputy Vice-Chancellor (Global Engagement) visited our partner universities in China from 12th to 13th November, 2018. On 12th November, Academic Advisory Board meeting of WESTA was held. All parties discussed about the teaching calendar, teaching evaluation etc. 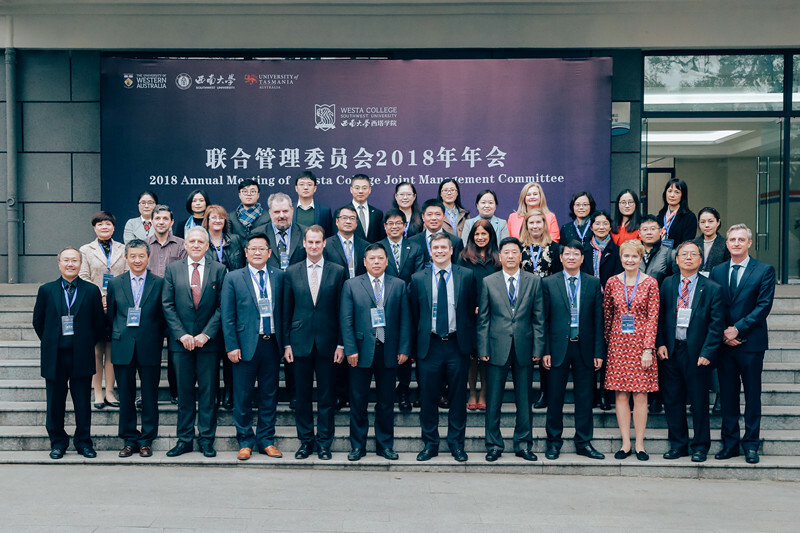 On 13th November, UTAS, UWA and AEMG Delegation participated the Annual JMC meeting of the WESTA College, which was hosted by Prof. Yule JIN, Vice President of Southwest University. Prof. Weiguo ZHANG, President of the university delivered a welcome speech to all the guests from partners and specially acknowledged AEMG’s supports. During the meeting, the four parties summarized the experience of running WESTA College and discussed about the details of the further collaboration. Also, they worked out a strategic plan for 2019. The visit further enhanced the communication between AEMG and our partner universities and ensured a smooth and efficient operation of the cooperative programs.